This salad has a fresh, salty tang and is a perfect fit for summertime tomatoes! If you don’t feel like roasting the peppers, buy good quality roasted red peppers in jars. Same goes for the vinaigrette. 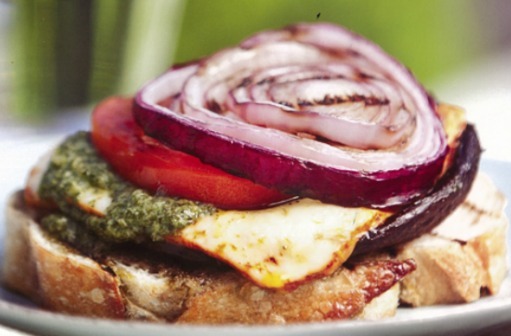 This will save you time and make the salad really easy to put together. Preheat a gas or charcoal grill on medium heat, or preheat the broiler to char the peppers. You can also use the flame of a gas burner. Put the peppers directly on the grill or on a broiler pan, or hold with tongs over the gas flame and char on all sides, turning to blacken evenly. This will take 5 to 8 minutes in total. Peel the peppers (do not worry if a little blackened skin clings to the flesh) and then remove the stems and scrape out the seeds. (Do not do this under running water.) Cut the peppers into 1-inch pieces. 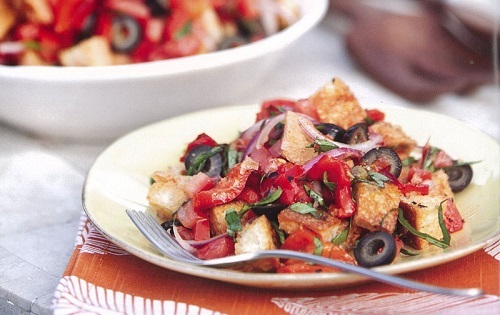 In a large bowl, mix together the toasted bread, charred peppers, tomatoes, basil, onion, capers, and olives, if using. Toss with the vinaigrette and season to taste with salt and pepper.